Agartala: Fragments of a US military aircraft, used during World War II, have been recovered in northern Tripura 66 years after it crashed, defence sources said here Saturday. 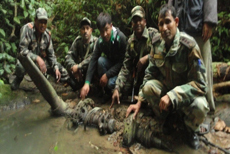 "After more than 66 years of being considered unrecoverable by many, the remnants of an American aircraft, C-47B, which crashed during World War II, were recovered by a team of 34th Battalion of the Assam Rifles last week in northern Tripura," an army official told IANS. The remains of the aircraft were found at the remote tribal village of Birmani Para in the Dhalai district in northern Tripura, 125 km north of state capital Agartala. The official said: "A series of search operations had been launched since September last year to find out the crash site in the thick and dense forests of all three hill ridges of northern Tripura -- Baramura, Atharamura and Longtrai. Finally, our troopers achieved success last week." The army official said that during World War II (1939-1945), the Allied forces lost hundreds of aircraft in the China-Burma-India (CBI) theatre of operations. "The majority of Allied crashes were caused by inhospitable weather, mechanical failure or navigational errors. The American Joint Prisoners of War and Missing in Action Accounting Command (JPAC) had identified 16 known crash sites in northeast India where Allied forces aircraft had crashed during World War II," the official said. "On May 17, 1946, the ill-fated C-47B aircraft crashed in Tripura along with 11 members, due to heavy storm conditions while transporting the remains of Allied POW (Prisoners of War) from Yangon (erstwhile capital of Burma now Myanmar) to Calcutta," the official said. "The 34 Battalion Assam Rifles under the aegis of the para-military's 21 sector headquarters in Agartala was tasked to find out the details of the aforesaid aircraft and accordingly launched the hunt," a visibly cheerful army official said. He said that the mission was very difficult due to the inconvenient terrain of the area and since the aircraft had crashed 66 years ago. Besides, the ecology had changed a lot over a period of time. "Dense forests and inhospitable topography made search operations even more cumbersome. The propeller of the said aircraft was also recovered," the official said, adding that elderly locals faintly remember the crash and aided Assam Rifles troopers to find out the crash site as also the graves where the crew had been laid to rest. Meanwhile, several myths about the crash of the aircraft are still popular among local tribesmen in the mountainous northern Tripura. "Late novelist Bimal Sinha, also the former Tripura health minister, in his novel 'Karachi theke Longtharai' (Karachi to Longtharai) had explicated many tales about the crash of Allied fores' aircraft in Tripura," writer Tapas Debnath told IANS. "During World War II, the Agartala airport was used by the United States Air Force. In 1942-43, the 10th Air Force and the 4th Combat Cargo Group (CCG) flew C-46 Commando transport aircraft over Burma, now Myanmar," said an official document of the Tripura government. It added, "The Agartala airport was also used as a supply point from which the US Air Force units air-dropped packets of supplies and ammunition to the advancing Allied forces on the ground." "The 4th CCG operated from the airport during December 1944 and January 1945 when the unit moved to Chittagong, now in southeast Bangladesh." Dhananjay Bele, President of Nashik Industries & Manufacturers Association (NIMA). addressing the industrialists' meet in Malegaon Friday. 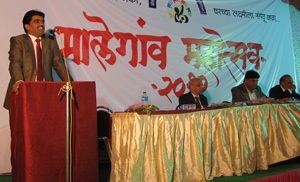 The meeting was organised as part of Malegaon Mahautsav 2012, a three day event which began on January 06.